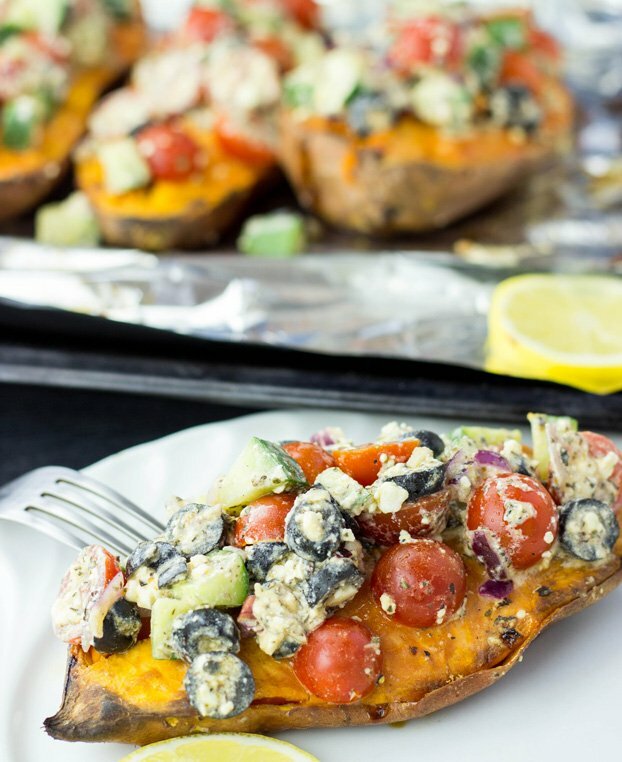 Baked Sweet Potatoes with a Five Star Feta Salad | Delish! We’ve been wanting to share this recipe with you for quite a while now, but for one single reason, we haven’t. 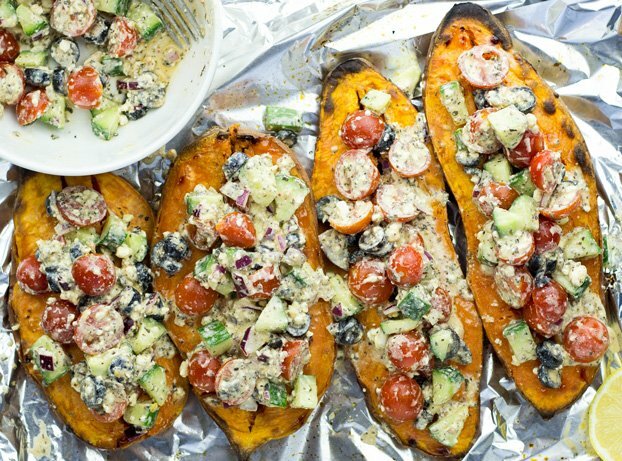 It’s nothing to do with the taste of course – this baked sweet potato and feta salad dish is fantastically tasty – nor is it to do with the health benefits – this recipe is full of them. Sweet potatoes themselves are chock full of beta-carotene – which in turn raises our vitamin A levels (1). And vitamin A is awesome (2). To make the most of this you’ll need a little fat too – so our recipe includes a few olives and a little olive oil. Yummy. The tomatoes, onions and feta cheese each bring their own positives to the table too. No worries there. No, the reason we hadn’t shared this recipe until now was all because of the cooking methods of the sweet potatoes themselves. The simplest method took the longest, and the shortest was the most complicated. 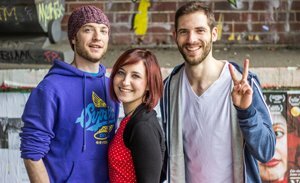 We love our food to be easy and really quick, and weren’t quite sure of the best compromise. 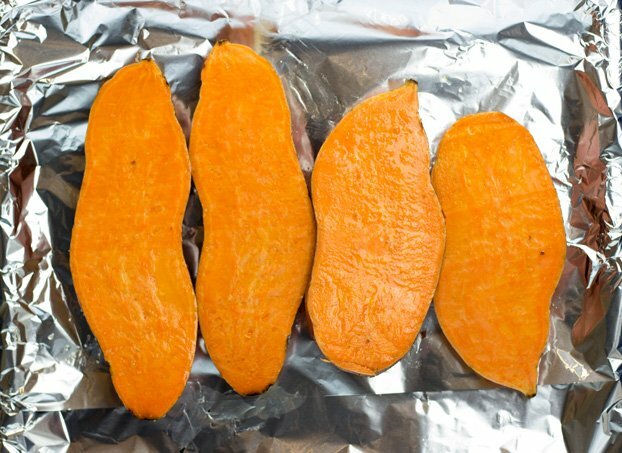 There are various ways of cooking sweet potatoes, and here are our favourite methods. 1- Just bake. This is our favourite, and by far the easiest. Chuck the potatoes on a baking tray and layer of foil and get them in the oven. Tip: After giving the potatoes a quick wash, coat the skin in olive oil and a sprinkle of salt for an extra punch of flavouring! They’ll be ready in roughly 50 minutes, give or take a few depending on the size of the potato. If the potatoes are really big then slicing them length-ways will speed up cooking time. When the skin is loose, they’re ready. That’s it, the oven does the hard work. 2. Quarter the potatoes and boil them for 20 minutes. After that, pop them in the oven for a further 10 minutes to give them that crispyness and ‘just baked’ feeling. 3. Peel the potatoes* and cut them into small cubes. This prepping takes a little longer, but they’ll only need about 25 minutes of baking in the oven then. 4. Peel the potatoes and cut them into small cubes. You can then steam them in just 7 or 8 minutes. Again, the prepping takes longer but the cooking time is really quick. *You don’t need to peel the potatoes if they’re organic, and the skin looks good. You can eat it. If it looks a bit skanky (it often does) we prefer not to eat the skin, no matter how they’re cooked. 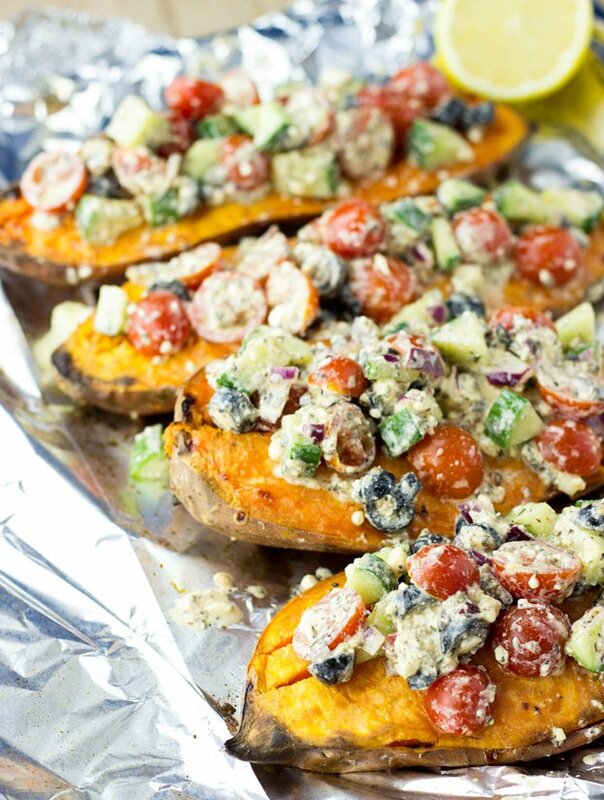 Baked Sweet Potatoes with a Five Star Feta Salad. Crispy sweet potatoes mingle with a tangy feta salad in this deceptively simple but tasty dish. Wash the potatoes and rub a coat of olive oil and salt on the skin. Next, put them on a baking tray and layer of foil. Off they go in the oven. Depending on the size of the potato they’ll be ready somewhere between 45 and 60 mins. You can tell when the skin becomes loose (just prod them) and your fork glides easily into the potato. If the potatoes are massive then slice them length-ways before cooking to save time. This way of cooking the potatoes is our favourite overall, but if time is of the essence then we’ve listed a couple of alternatives in the blog post. While they’re cooking, cut or crumble the feta cheese, cut olives, cherry tomatoes, basil, peel and dice the onion and mix it all up in a salad bowl. 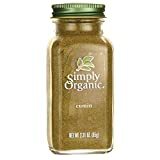 Put the basil, cumin, cayenne pepper, ground pepper, grated garlic, olive oil and lemon in a cup and stir well. Add the contents of the cup to the salad bowl and stir well. When the potatoes are ready (cut them open if they’re not already) pop them on a plate and layer the salad mix on top. Finally, add an optional dollop of Greek yogurt or natural plain yogurt. 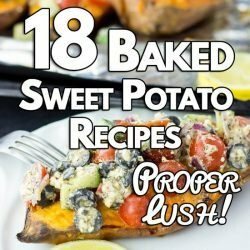 18 Baked Sweet Potato Recipes | Proper Lush! I love anything with sweet potatoes! This recipe sounds great! I just love this recipe! I’m a sweet potato lover, and I have two in my bin right now just waiting to be used! This is great! That topping looks so delicious and creamy!! Yummy! Holy wow! This looks awesome. I love all the flavors! 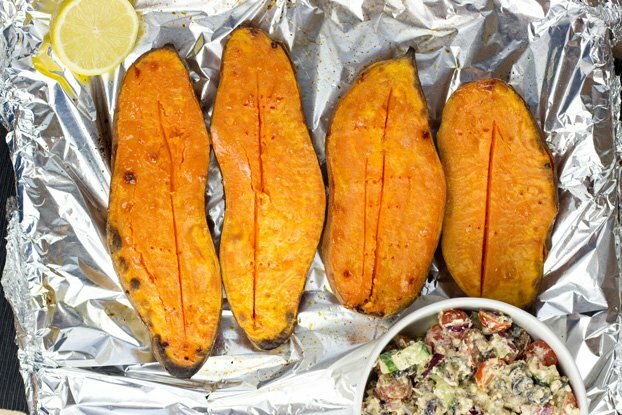 Is there anything better than baked sweet potatoes? Uh yes, adding a feta salad to it! Looks amazing! 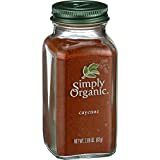 I love sweet potatoes and use them for so much! I love to top chili on mine! I love all the wonderful flavors you used here, especially the cumin! I bet it all tastes fantastic and the colors are so vibrant! 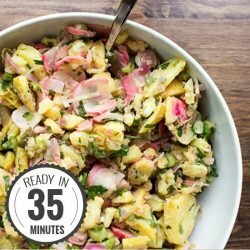 This looks great and has some of my favorite ingredients. 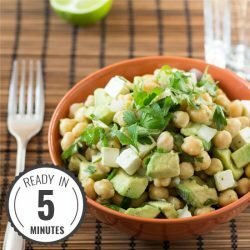 I definitely have to try it with vegan feta. 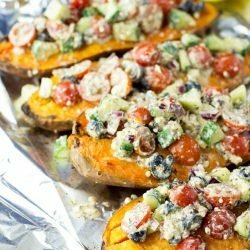 I can imagine how tasty a feta salad would be on a baked sweet potato. Great idea, really inventive and a smart use of flavors! This is such a great recipe! It is really tasty and sooo easy to make. Thanks for your feedback, awesome you liked these potatoes!! You are vegetarian for all the right reasons but it’s a big pity in my opinion to forget the environment in your methods. I feel aluminium foil is a BIG no no. Just use oil and salt, cut the potatoes to desired size and bake on a high heat. I use 200C turbo and they are ready in 30 to 40 minutes.